The hippo is the third largest animal in the world, after the elephant and the rhinoceros. 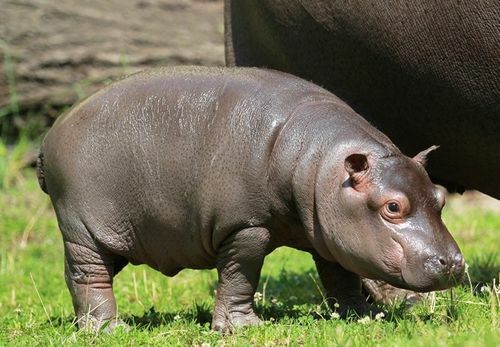 There are two types of hippos: common hippopotamus from south Sahara in East Africa (the big one) and the small one named Pygmy hippopotamus (Choeropsis of liberiensis) which comes from West Africa, and it is less common. The size of the common hippopotamus is about 4 meters in length and 1.5 meters high, with a weight of up to 3500 kg. The smaller one has a weight of almost 270 kg and a length of 1,7 m. There’s not very much information about this kind of hippo. Because the hippos don’t have any sweat glands, they manage to maintain their low temperature by staying mostly in water. However, they secrete a red liquid that keeps them away from sunburn. Although they stay underwater, hippos can breathe, hear and see very well. A very important characteristic of theirs is that their nose and ears close very quickly when they are completely underwater. As for the females, they reach sexual maturity at the age of 5 or 6, having a gestational period of about 8 months. 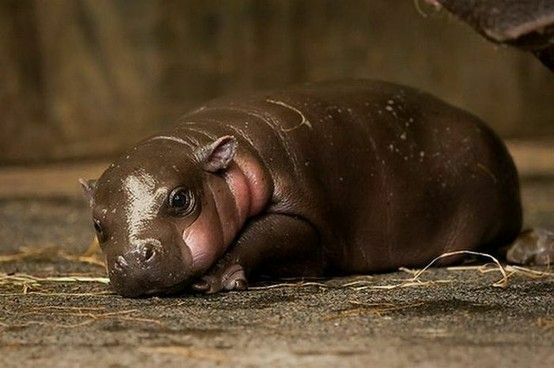 Some studies have revealed that female puberty may start around the age of 3 or 4, whereas the mature period for male hippos starts around the age of 7-8. A study on the reproduction of hippos revealed that peak conceptions were only during the final period of the rainy season in summer. However, the peak number of births took place at the beginning of the rainy season in winter. Hippos are known for giving birth to a well-developed calf, and this is happening every couple of years. Copulation takes place underwater, the female being submerged during mating, having her head emerged sporadically just to breathe. Babies, which are born in the same conditions, are weighing around 50 kg and measure around 127 cm in length. After they are born, they have to swim up to the surface to breathe normally. Usually, female hippos give birth to no more than one or two calves at once. After that, they carry babies on their back until they are old enough to swim in deep waters. Babies are used to suckle after their mother is leaving the water and after around 8 months the babies are weaned, ready to take care of themselves. 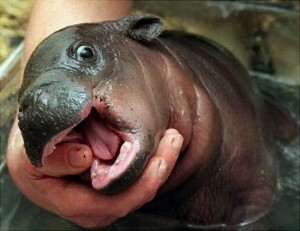 As for the look of a hippo, they have short legs, a big body and an enormous mouth. They might look a little bit plump, but they definitely run faster than humans. They are, also, very aggressive when they are being threatened. That’s why they are considered as one of the most ferocious animals living in Africa. Being threatened all the time and hunted for its meat and teeth, the hippo is considered to be, in some areas, an endangered species. Usually, hippos live for around 40-45 years and they mainly eat grass. As for their babies, these ones are called calves, females are called cows and males hippos are called bulls. Words like herd, bloat, even pod and dale, mean groups of hippos. © 2019 Baby Animal Facts	- Theme: Patus by FameThemes.